﻿Doctor ﻿Strange ﻿has ﻿appear ﻿on ﻿numbers ﻿posters ﻿over ﻿the ﻿years. ﻿Some ﻿of ﻿these ﻿posters ﻿feature ﻿him ﻿specifically ﻿and ﻿others ﻿also ﻿contain ﻿other ﻿Marvel ﻿characters. 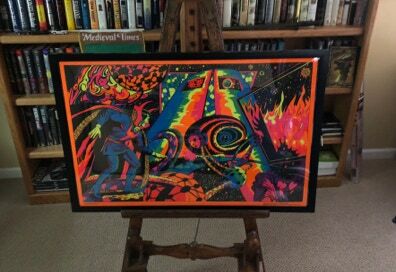 ﻿Posters ﻿that ﻿are ﻿not ﻿simply ﻿reproductions ﻿of ﻿comic ﻿cover ﻿art ﻿can ﻿represent ﻿great ﻿pieces ﻿of ﻿inexpensive ﻿art. ﻿Posters ﻿can ﻿be ﻿easily ﻿and ﻿cheaply ﻿framed ﻿and ﻿displayed ﻿on ﻿walls ﻿as ﻿an ﻿alternative ﻿to ﻿expensive ﻿art. ﻿There ﻿have ﻿been ﻿some ﻿wicked ﻿Doctor ﻿Strange ﻿related ﻿images ﻿on ﻿these ﻿posters ﻿over ﻿the ﻿decades. ﻿Doctor ﻿Strange ﻿art ﻿is ﻿also ﻿included ﻿on ﻿this ﻿page. ﻿Examples ﻿of ﻿art ﻿are: ﻿prints, ﻿original ﻿art, ﻿animation ﻿cells, ﻿production ﻿drawings ﻿original ﻿art ﻿on ﻿blank ﻿comic ﻿book ﻿covers ﻿and ﻿original ﻿art ﻿on ﻿trading ﻿cards. ﻿Statues ﻿and ﻿other ﻿forms ﻿of ﻿art ﻿can ﻿be ﻿found ﻿on ﻿other ﻿specific ﻿pages ﻿in ﻿the ﻿Archive. ﻿Refer ﻿to ﻿the ﻿menu ﻿above ﻿for ﻿links ﻿to ﻿the ﻿other ﻿pages. ﻿If ﻿you ﻿run ﻿across ﻿any ﻿Doctor ﻿Strange ﻿related ﻿collectables ﻿not ﻿listed ﻿here ﻿on ﻿the ﻿Archive, ﻿please ﻿let ﻿me ﻿know. ﻿I ﻿am ﻿always ﻿interesting ﻿in ﻿items ﻿I ﻿do ﻿not ﻿have ﻿in ﻿my ﻿collection. ﻿If ﻿you ﻿are ﻿involved ﻿in ﻿the ﻿industry ﻿and ﻿have ﻿any ﻿production ﻿information ﻿please ﻿let ﻿me ﻿know. ﻿I ﻿would ﻿love ﻿to ﻿include ﻿that ﻿in ﻿the ﻿item ﻿descriptions ﻿when ﻿available.